It’s Sunday! 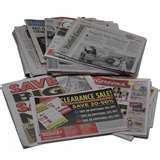 Which means tons of new sales flyers to scour for deals even if you don’t get the paper. You don’t have to work hard to figure out the deals because there a lot of other websites out there doing the work for you. Once upon a time there was another Green Bay-area site called GB Savers. When Green Bay Consumer started, we believed there was no reason to repeat what they were already doing. When GB Savers shut down, we started filling in the missing store matchups like Festival Foods and Piggly Wiggly. Fast forward three years; there are several sites in Wisconsin doing most of our area stores. Because of that we are going to back off from the grocery store matchups. We hate being redundant! We can, however, point you in the direction of our favorite blogs and all their hard work! One of the things that isn’t covered on Green Bay Consumer much is shopping at drugstores like CVS and Walgreens. Why? There are at least 100 other sites that cover those stores! Another reason we don’t cover the stores much is simply that I do not shop at them for a few reasons. 1. Voodoo Economics. That’s what I call it when you get a coupon to take money off on your next purchase. Providing you need to return to the store within the short redemption time frame and ONLY buy something for the exact price of the Register Reward. Otherwise you will be spending more money, albeit not as much. Also, what if they have nothing on sale within the next few weeks that you want? 2. Small inventory. When there is a really good deal, you can go to the drugstores on Sunday morning and all 4-5 of that item are already gone, taken by the multitudes that want that deal, too! Despite sometimes getting restocked during the week, that means another trip (and gas money) to go get your items “for free”. If you want to stock up, good luck! It may require several trips to several different drugstores throughout the week to get what you want. I don’t have time for that kind of shopping. 3. Products available. The drugstores are fine if you regularly use those products that they have on sale and can combine coupons/earn register rewards. My family, for the most post, don’t use most of those items. I’ve had friends say “You mean you don’t like free toothpaste, shampoo or cereal?” Of course I do! However, I buy organic/non-conventional toothpaste/shampoo/cereal. Which means the deals aren’t deals to me personally. When I have seen a great deal on something like Tom’s of Maine toothpaste, see my point #2–they are out of stock! That’s not to say mastering The Drugstore Game, as it’s called, is not a great idea. If it works for you and your family, great! It just doesn’t fit our family’s needs. As I always say, Do what works for you! If you want to master The Drugstore Game, I recommend you check out the book The Lazy Couponer. Mastering the drug store “game” can net you most of your toiletries for free. I tried and succeeded at the game of using Register Rewards (Walgreens) and Extra Care Bucks (or ECBs at CVS) but found that many of the products did not suit our family. But that’s not to say it’s not good for your family! If you really want to know what’s going on at CVS or Walgreens, I highly recommend Coupons, Deals and More. Ann’s site includes a “how to” if you’ve never shopped the drug stores before. You can get information on all the CVS deals here. You can get information on all the Walgreens deals here. Mastering the drug store “game” can net you most of your toiletries for free. I tried and succeeded at the game of using Register Rewards (Walgreens) and Extra Care Bucks (or ECBs at CVS) but found that many of the products I was getting for pennies did not suit our family. That’s not to say it’s not good for your family, though! Advil PM (4ct) $1 – $1 manufacturer coupon (from the 10/28/12 insert) = FREE! You’ll also be able to find this link anytime on the Green Bay Consumer home page under “This Week’s Sales”.